The successful City Surf Series platform is not only helping local South African professional surfers with achieving their goals but also has a positive effect on the international contingent of aspiring professional surfers visiting the shores of South Africa to compete in the series. 19 year old Brisa Hennessy (Costa Rica) has just clinched her spot on the 2019 WSL Championship Tour (CT), achieving her lifelong dream of becoming an elite professional surfer in just her second full time year battling it out on the WSL Qualifying Series. 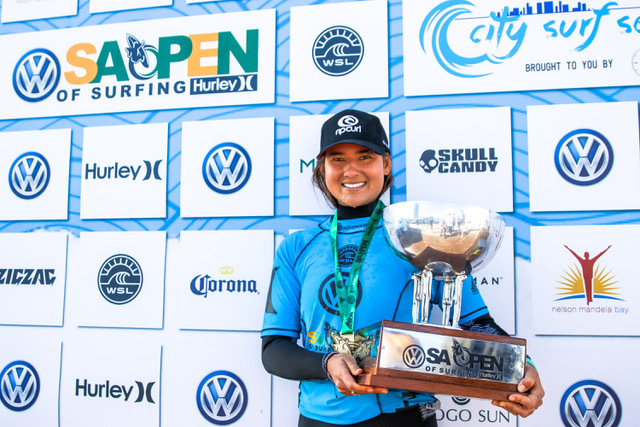 This accomplishment makes her the first ever Costa Rican surfer to qualify for the CT and her win at the 2018 VW SA Open of Surfing presented by Hurley helped catapult her up the QS ratings. Due to the event being the biggest Women’s QS rated competition on the African continent and holding 3000 valuable points for the winner, this event sits as Henessey’s 2nd counting result on her QS ratings scorecard. The young 2019 CT Rookie cemented her qualification in the final QS6000 event of the year at Birubi Beach, New South Wales, Australia when she placed equal fifth after being beaten by eventual event winner Nikki Van Dijk (AUS) yesterday.